Here's a new project which has turned out to be tremendous fun. It's the SN-Exerciser, a noisemaker box which packs quite a wallop despite needing but two chips. 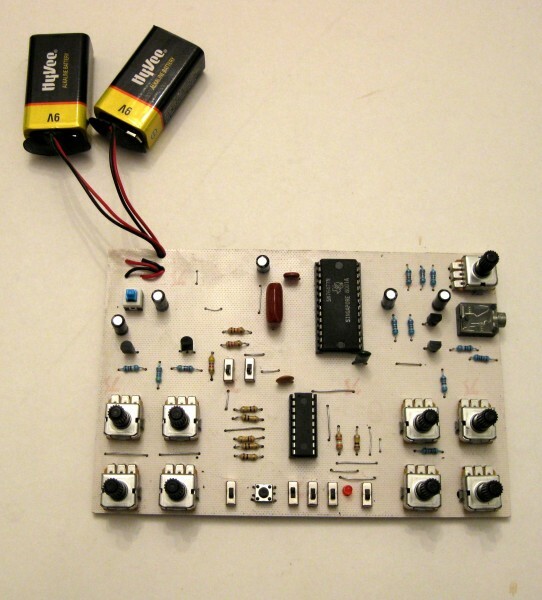 The SN-Exerciser includes a VCO, LFO, sweepable white noise source, envelope generator (Attack/Sustain/Release), VCA, and a separate clock for repetitive triggering. The VCO offers a 20% duty cycle for reedy sounds, and a 50% duty cycle for fuller bass sounds. Moreover, it can be frequency modulated by the LFO at the flip of a switch. The VCO operates from 2 Hz to 6000 Hz (a 3000:1 sweep range), while the LFO operates from 0.025 Hz to 130 Hz (a 5000:1 sweep range). The Attack and Release are variable from 5 mS to 5 S. The repeat mode is variable from 12 bpm (beats per minute) on up to 600 bpm. The whole shebang runs off of two 9V batteries. Current drain has been kept to a very low +/- 5 mA. All switches are fully decoded; there are no difficult configurations to memorize. Just flip a switch to engage a feature, and the circuit takes care of the messy details for you. And there's no range-switching; all continuous controls simply require a single pot, and that's that. The unit may be operated in a locked mode (always on), a triggered mode, a continuously repeating mode or a triggered repeating mode. The output is line level, with a volume control and stereo output jack for connection to an outboard amplifier and speaker. The SN-Exerciser is designed around the SN76477 complex noise chip (still readily available on eBay) and the common PIC16F88. Unlike the SN data sheet, however, I have used transistor current sinks to completely jettison the need for range-switching. Thus, instead of a fixed resistor setting basic parameters, variable current sinks control the VCO, LFO, noise clock and noise filter for an extremely broad range of sounds. The SN76477 even contributes the regulated +5V needed by the PIC. The latter runs at 1 MHz to keep the current drain 50% below spec which is 10 mA max. The PIC takes care of converting pot values for repetition rate and sustain times to digital by means of its ADC converters. All in all, I believe it will be hard to find a more complete soundmaker which uses so few components. I designed my own circuit board using FreePCB, and etched the board right in the kitchen. The schematic, and hence netlist, was created with TinyCad, which is also free of charge. There is one minor kludge to the PCB to be made. On the PCB, pin 16 of IC1 runs to ground. You need to cut that trace, and instead connect it to a voltage divider (12k/1.5k) from +5V to ground. (The schematic shows this update properly). This ensures the pulse width switch really does choose between 20% and 50%. It's an easy alteration to be made; I did it directly on the underside of the PCB. I used CTS circuit board mounted pots (from Digi-Key), and all of the switches were from Microtivity (ordered via Amazon). The circuit board mounted stereo 3.5mm jack is from All Electronics. All of the other parts are common and junkbox parts should fit the PCB without problem. Be sure to follow the schematics carefully. There are -9V, +9V and +5V power supply connections. Don't mix them up. I consider PMP to be the most powerful compiler available, and yet you can get it for free. Likewise, this project is completely free. I'll post everything below: schematics, PCB artwork and files, source code. All I ask in return is that you keep my name on it, spread the word about electro-music Forum, TinyCad, FreePCB and PIC Micro Pascal. And here is the FreePCB design file. It occurs to me that a Picaxe microcontroller could probably be used with the SN-Exercise, with no change to the hardware. Just be sure to specify a 1 MHz clock speed to keep the current drain below what the onboard Zener can provide. The advantage, of course, is that you won't need a special burner. Is there a .hex file for this? You can find the hex file attached. So Im thinking of using a softpot for pitch here. Ive got a 10K 50cm one, so thinking that it might work just putting it where the 100K is now, put the 100K between softpot and 9V with top two legs together (as coarse tune) and done? Or is some resistor changes in order to make that work?